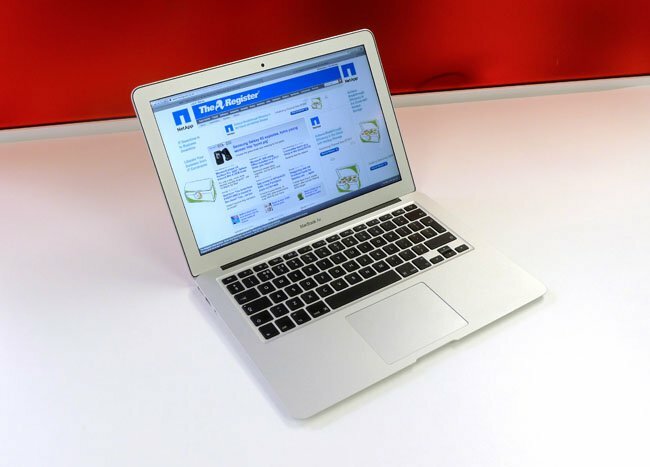 Review Part One El Reg’s review of the latest 13-inch MacBook Air comes in two parts: here, I take a look at one of the build-to-order configurations offered by Apple, which upgrades the standard 1.3GHz Intel Core i5 processor, 4GB of 1066MHZ mobile DDR3 RAM, 128GB solid-state drive specification to a 1.7GHz Core i7 machine with 8GB of RAM and a 256GB SSD. Separately, you can read m’colleague Bob Dormon’s thoughts on the standard version of the new Air, which he tackled as a potential Windows machine. 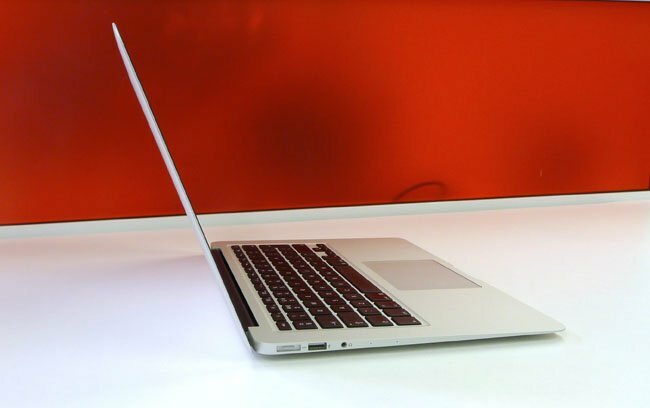 It’s worth a read even if you’re not a Windows user because the Boot Camp experience revealed some interesting changes Apple has made to the hardware in order, we reckon, to deliver the major improvement in battery life both machines provide. The reason I wanted to get hold of the upgraded version of the Air is, of course, because Apple’s mania for providing punters with sealed units containing "no user-serviceable parts within". I couldn’t just throw in the extra memory and storage myself. The Air’s memory is soldered onto the motherboard, leaving the Wi-Fi card and the SSD flash storage as the only readily removable components - and, as you’ll see, swapping out the SSD is a non-starter: it needs a special Apple cable to interface with the motherboard. Now I - and, I suspect, most of you lot too - find this irritating. I want to be able to increase my computer’s memory and storage capacities over time as I see fit. But I also find myself increasingly wondering whether that’s as sensible a view to take as it once was. My travel machine is still a 2010 Core 2 Duo-based 11-inch Air with a mere 2GB of RAM and I’ve not felt the need to increase that capacity, even though it gets used for pretty much all the ‘pro’ tasks I put my main, largely desk-bound machine to. I’ve wanted to upgrade it, and probably would have done if I could, but the truth is I’ve not actually needed to. Likewise, I don’t feel hindered by losing the ability to swap out a battery, largely because I’ve found by experience that a sensible charging regime and a few battery prolonging tricks can eke out a charge to keep me up and running until I can get to a power outlet - all without compromising how I use the computer. And if integrating the battery makes for a slimmer, less weighty, more portable machine, I’m all for it. That’s a trade I am willing to make, though it’s clearly not one other folk will want to accept, especially people who spend a lot of time on ten-hour-or-more flights. So people who expect to be able to tinker with the insides of their computers are not going to like the new Air any more than they did its predecessors. Possibly less so since Apple has - surprise, surprise - introduced a seemingly proprietary connector for the machine’s SSD. The good news is the machine’s battery life, which is considerably improved over previous MacBook Airs and of other vendors’ laptops too. Perhaps that extra battery in your pack really will be made redundant at last. Thanks for that should be laid at Intel’s door. Apple has upped the raw battery capacity a tad, and it’s made some other tweaks too, but it’s the Air’s Haswell processor from Chipzilla that really makes the difference. It’s not the only new technology the new Air incorporates: the new Mac also features the latest in Wi-Fi technology, 802.11ac, and SATA Express storage. I’ll look at these in turn shortly, but it’s worth first running through the rest of the 2013 Air’s attributes, though almost all of them were present on earlier models. The Air’s design is as slim and as aesthetically pleasing as ever, but its aluminium alloy shell has solid practical benefits too, as anyone who has ever dropped one onto a hard floor will attest: it’s as tough as. The keyboard is solid, with negligible flex: it’s there if you really push hard, but you won’t see it under ordinary use. The deck is backlit too, which is one of those features that, when you suddenly find you could really use it, you sorely regret its absence. I miss it when I’m using my 11-inch Air, and I’m pleased to have it here. 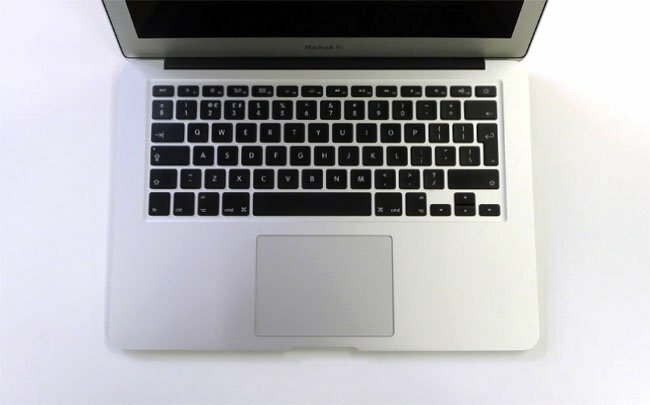 The large, glass-covered trackpad is, as ever, smooth and easy to use: OS X provides support for multiple taps to handle right clicks and such, and there’s a whole host of rotate, zoom, multi-finger swipes that you can make use of. I won’t say you don’t need a mouse, but a lot of users can dispense with one when they use this pad. 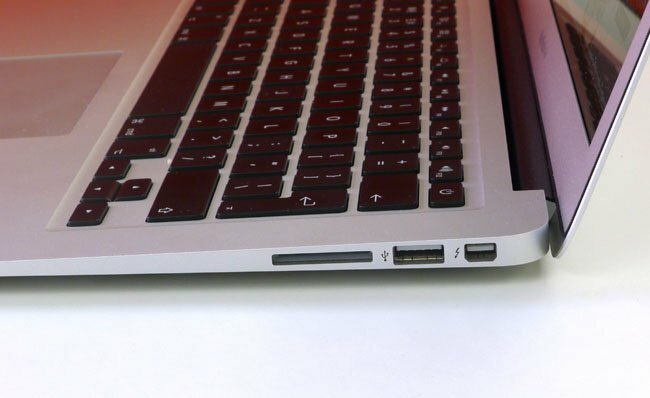 Apple remains as parsimonious as ever with ports: just two USB 3.0 connectors here, along with an SDXC-compatible card slot and a Thunderbolt connector. I was playing with a new Sony Vaio Pro last night, courtesy of Amazon, and it’s no more generous. 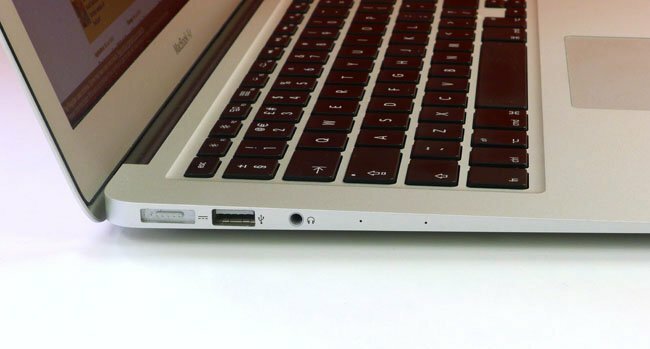 You won’t be surprised to learn that no adaptors are included in the Air’s box - nor, as was the case in the all recent MacBooks, any form of software installation media. There’s no point bundling a DVD with a optical drive-less computer, but there’s no USB stick, either. Instead, there’s a 650MB recovery partition on the SSD. That’s fine so long as you have an internet connection to download the operating system and your drive isn’t up the spout. If it was, of course, being non-standard, it would still need to be fixed by Apple. Apple undoubtedly argues that this is much better for the non-technical buyer. Cupertino is probably correct, though its approach is of little advantage to the technically capable, whether they’re Mac owners themselves or have simply been called in to fix a friend’s computer.